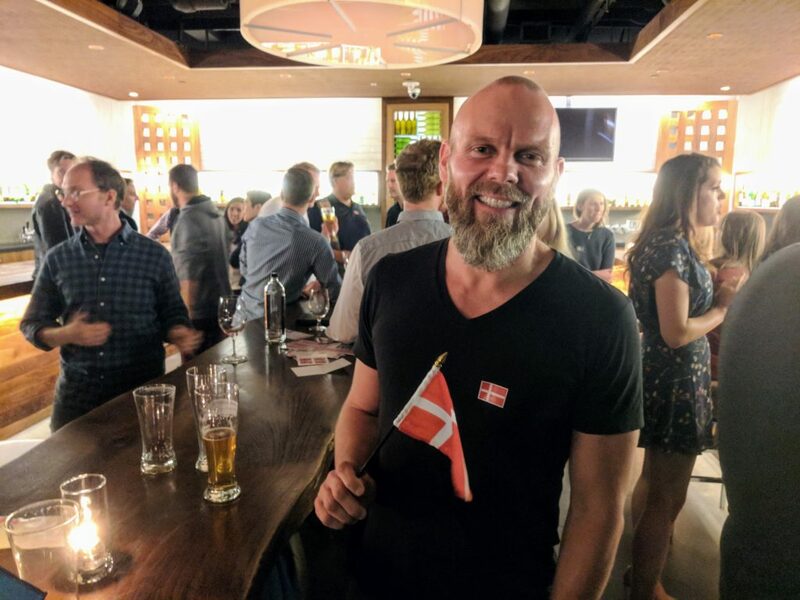 First of the autumn season, members of the Young Scandinavians Club met again for our monthly Happy Hour on October 13th in downtown San Francisco. We had a reserved section of the cosmopolitan bar Press Club near Union Square, where members and newcomers enjoyed craft beers and wines while exchanging stories of their summer travels and beyond. 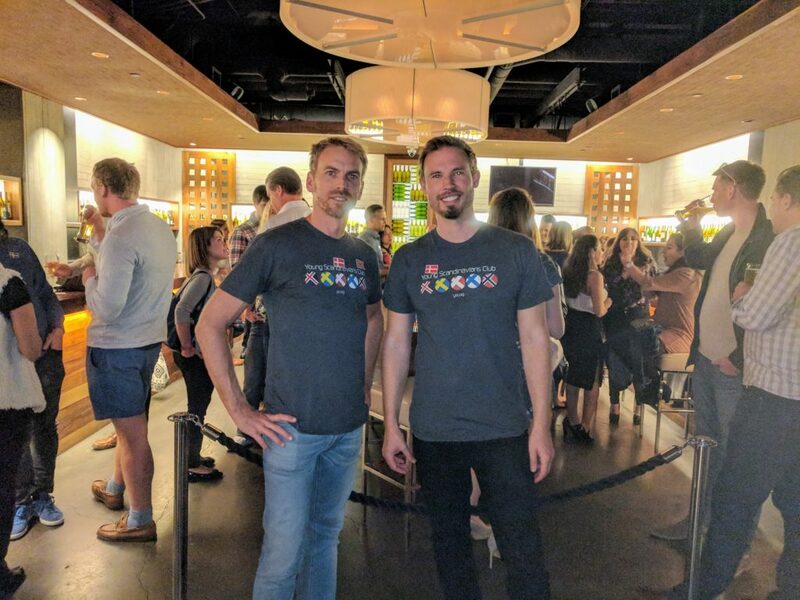 This Young Scandinavians Club Happy Hour event was hosted by two long-time club members, Andrew Vik and board member Henrik Thorenfeldt. Vik is a native of San Francisco with rich ties to his Danish and Norwegian heritage. Thorenfeldt hails from Viborg, Denmark and has made San Francisco his home for the past 17 years. At its peak, we had a great turnout of over 60 Young Scandinavians, with many new faces greeted by fellow Nordic expats and young professionals. Emmie D. from Sweden was one of these new faces. 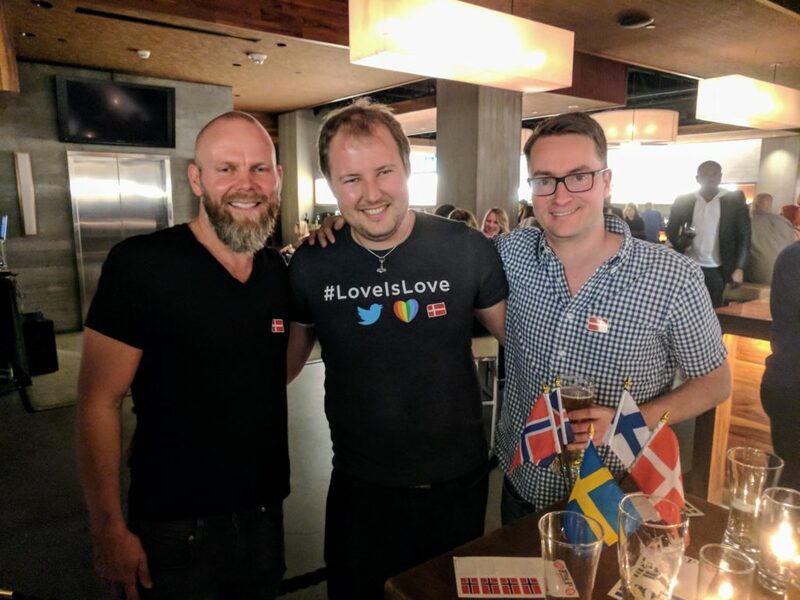 She stopped by with her boyfriend Ted for some wine and conversation, joining the attendees wearing a flag sticker designating their origin country (Sweden, Denmark, Norway, Finland, Iceland or United States flag). She moved to the SF Bay Area last summer and works at a law firm in the city. 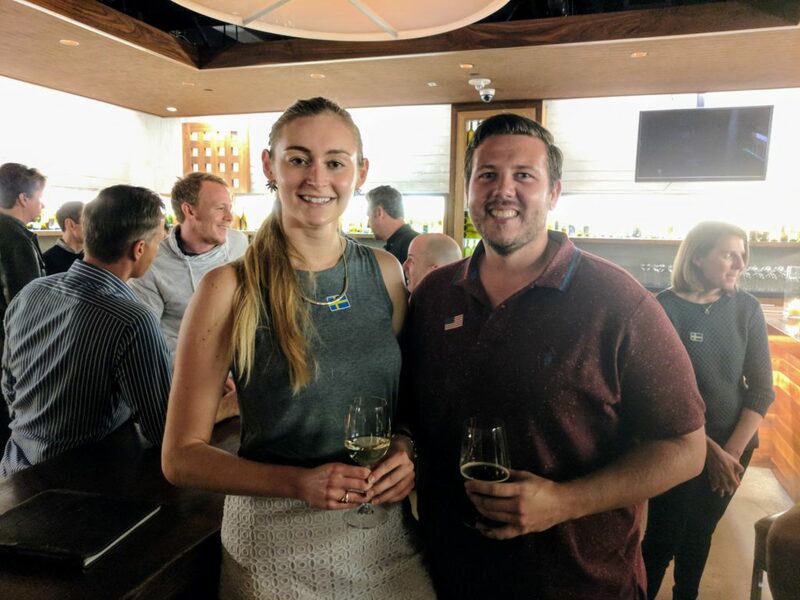 Danish native Torsten Kolind (right), living in San Francisco for 8 years and founder of YouNoodle, was also in attendance to check out Press Club and catch up with Young Scandinavians Club members over some local öl. 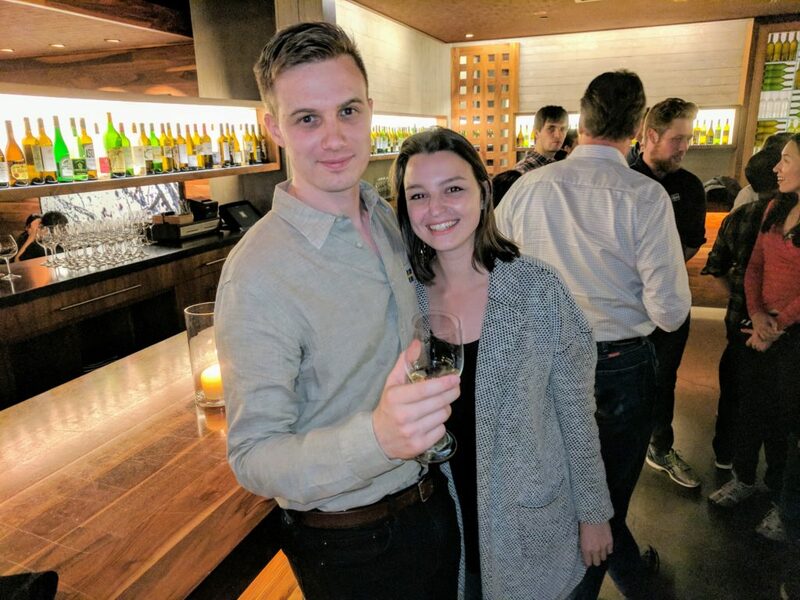 Sven Elgren, a software engineer from Sweden, checked out the Young Scandinavians Club Happy Hour with his girlfriend, Danielle Freeman. She has taken language courses at the Scandinavian School on Woodside Avenue in San Francisco’s Forest Hill neighborhood. With all the Scandinavian-speaking and Scandinavia-philes in tow, she got a chance to practice her language skills! New faces met with veterans of the club, keeping the culture of the Young Scandinavians Club rich and vibrant with traditions. Long-time member Jesper Madsen, living in San Francisco for 16 years, attended the event after a big end-of-summer trip to the Pyrenees. With a beard that rivals Odon’s, this active Dane hiked 900 km from the Atlantic to the Mediterranean in 50 days. WOW! Another fun and successful event for our Young Scandinavians Club. Check out our events page to stay up to date with more Young Scandinavians Club Happy Hours and events coming up. Now that’s how we say skål! If you’re interested in joining our club, visit our membership page here. Like us on Facebook and add us on Instagram. Article by Karolin Palmer-Picard, half-Swede and member since 2015.